Baku is a city of juxtapositions. The Old City is sprawled out with the Baku Flame Towers in the background. Old Soviet buildings neighbor modern Azeri ones. Azerbaijan has changed hands several time, but by international standards, it’s still a “new” country, finally gaining its independence from the Soviets in 1991. Baku is old and new, new and old. A weekend in Baku is enough to make your head spin. But yes, we’re talking about the good kind of head spinning. Directly translated as the “land of fire”, Azerbaijan is a natural resource-laden country whose main export is oil and gas. However, there’s a lot of cultural upheaval going on in this new-meets-old country that I found quite fascinating. This transition is especially prevalent in the capital city, Baku. While the rest of Azerbaijan confused and challenged me, I distinctly remember how joyful and excited I felt while exploring Baku. There’s a lot to unpack here, from the old marvels of the city to the strange contemporary buildings that have only just been built there. Throw in a slew of fascinating and unique natural attractions just outside the city limits, and you’ve got a well-rounded weekend in Baku ahead of you. 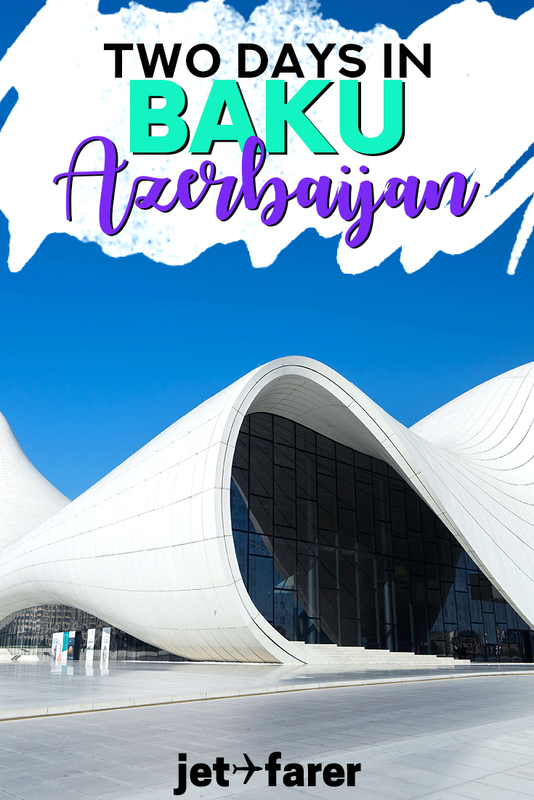 Throughout your 2 days in Baku, you can definitely experience the highlights of the city (although I always recommend spending more time in a place!). See below for the deets. Traveling to Azerbaijan requires a visa for citizens of most countries, including the United States. The good news is that it’s a completely online process to obtain an Azerbaijan tourist visa. 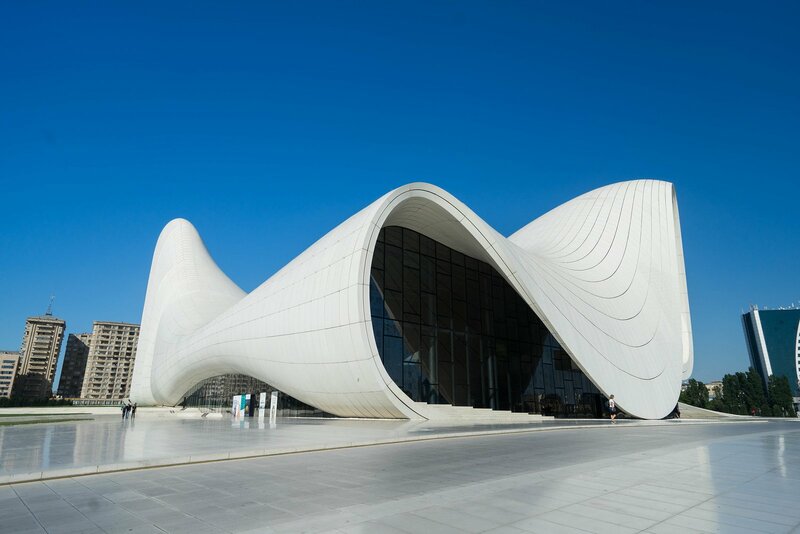 If you’re planning on visiting Baku, you need to apply online for your eVisa, print it out, and submit it to the immigration official when you arrive at the airport. It’s not a very hard process – it takes anywhere from 3-7 days for online approval and costs $25 USD. Flight: The easiest way to get to Baku from anywhere in the world is to fly into Heydar Aliyev International Airport. The airport has several flights a day, primarily from Europe, Asia, and the Middle East. You can compare flight prices and search for the best deals on Google Flights, CheapoAir, and Expedia. Overnight Train: If you’re coming in from Tbilisi, Georgia or Sheki, Azerbaijan, you can take an overnight train. These trains are exceptionally slow, but you can get a sleeper car and save yourself some money on a hotel. For more information on sleeper trains to Baku, Seat61.com is a fantastic resource. Ferry/Boat: If you’re arriving from certain destinations, like Iran or Turkmenistan, you may be able to take a ferry into Baku. However, most of the boats that operate in the Caspian Sea are cargo/commercial ships. Overland: There are buses into Baku from all over the region. Depending on where you’re coming from, it can take anywhere from a few hours to over a day. Within Baku, there are a few different bus stations where you may be picked up or dropped off – be sure to confirm which one you need to leave from! For currency, Azerbaijan uses the Manat (AZN). Despite the fact that there are card readers in lots of places, most transactions in Baku are made in cash. You can withdraw money from ATMs there, or simply exchange at one of the many exchange points throughout the city. Be sure to try and break your big bills when possible, as a lot of smaller restaurants and shops do not have much change. Budget: There’s no hostel in Baku that feels more like home than Sahil Hostel & Hotel. The dorm beds are comfortable and private, the property is squeaky clean, and there’s a relaxed but open vibe about it that makes it easy to meet other travelers. It’s walkable from practically everything, and super close to the seaside boardwalk (which I loved). And, at just a few USD per night, it is an amazing deal. Mid-Range: Whether you prefer a private room or simply want a comfortable, private place to stay, the Viva Boutique Hotel is the perfect sport for you. It’s affordable, the rooms are clean and cozy, and it’s a very central location – just a few minutes’ walk to the Old City and many other central areas. Walking: Central Baku is an extremely walkable place, and you’ll be able to get to many places within the city center on your feet. Remember that Baku is in a desert, so in the spring and summer months, it can get pretty hot during the day. If you plan on walking a lot, be sure to stay hydrated, wear comfortable shoes, and bring sunscreen, sunglasses, and a hat. Public Transportation: Baku also has a metro and bus system that’s ridiculously cheap to use. You can load them at Bakikart kiosks. First, you need to buy a card to use, which costs 2 AZN. Then, you can fill it with however much money you want. Rides on both the buses and the metro are 20 gopik (0.2 AZN) per ride. Uber/Rideshare: Baku is the only capital city in the Caucasus to use Uber, and that makes getting around incredibly convenient. If you have access to Wi-Fi or cellular data, you can simply call an Uber like you would in the United States and charge it automatically to your designated credit card. Most Ubers within the central city area cost 2-7 AZN. Taxi: Taxis are abundant in Baku and you can simply hail one from the street or have your hotel/restaurant call you one. However, this is the most expensive way to get around Baku, so keep that in mind if you’re budget-conscious. Surprisingly, there isn’t a huge food culture in Baku. You’ll find inexpensive kebab and döner shops – characteristic of the region – pretty much everywhere. There are also some traditional Azeri restaurants, but you’ll find when you visit one, it’s mostly fellow tourists and foreigners eating there. Despite the fact that they are mostly catered to tourists, I still think it’s worth trying a couple of Azeri restaurants during your stay to experience the traditional dishes of the region. With that said, the people of Azerbaijan are very proud of their traditional Azeri breakfasts, and I highly recommend trying one while you’re in the city. For a traditional-style breakfast, I highly recommend trying Sehirli Tandir at least once. Yes, it’s a bit pricey for Azerbaijan, but the freshly-baked, tandir-style bread, the delicious cheeses and honey, and the historic atmosphere of the place are certainly worth it. Another fantastic restaurant to try traditional Azeri food in Baku is Nargiz Restaurant. It’s an underground, centrally-located restaurant that has an extensive (I mean, HUGE) menu of traditional dishes and all kinds of variations on them. Again, it’s a little more expensive than the average meal, but it’s worth sitting down here to sample some qutab, piti, and dushbara. Arguably one of the coolest things about Baku is that it neighbors the Caspian Sea. The Caspian Sea isn’t really a sea, rather the largest salt lake in the world. Off the coast, you’ll see deep blue water, with oil rigs dotting the horizon. When you first arrive in Baku, it’ll probably be evening time, which means the city will be nice and cool for a stroll. The best place to take a walk and experience the sights and sounds of the city is on the Baku Boulevard. This beautiful, big walking area is full of both tourists and locals, and is a nice place to get a feel for the city. While there, you can stroll for a bit and grab dinner, or simply sit on a bench and admire the calmness of the Caspian Sea. There are also great views of the old city and the Flame Towers. After your walk, take it easy on your first night, because the next two days will definitely be packed with things to do. When I’m visiting a new city, I love spending a day just walking and wandering around its main areas. And luckily, Baku is a VERY walkable city. On your first full day in Baku, I recommend making a list of things you’d like to see and tackling them one by one, or simply taking a free guided walking tour of the city. I ended up doing both. My free walking tour guide, Eldar, was awesome – explaining some of the history of the city as well as some of the strange and lesser-known facts about many of the sights we passed by. *Sights included on the free walking tour. Bold means I highly recommend/would prioritize going here. If you’re in more of a ‘sit back and relax’ kind of mood, you can also opt for an organized Baku city tour. I like taking these tours every so often because they typically give you an insider’s perspective on the city, and include some quirky facts or fun stories to boot (and I’m a HUGE sucker for quirky facts about a place!). At sunset, end your day by heading up to the Upland Park viewpoint. Upland Park is arguably the best place in the city to watch the daily light show, which happens around 8:30 PM. There’s also a magnificent view of the rest of Baku and the Caspian Sea down below. While there, you’ll probably share the space with wedding photographers, joggers, skateboarders, families, and other light show spectators. It’s a great place to do some sunset people-watching, too. On your second day in Baku, I recommend actually getting outside of Baku to explore some of the weirdest and most wonderful sights near the city. The easiest way to do this is to book a full day Baku tour with TES Tour, which will take you to the mud volcanoes, Gobustan National Park, Ateshgah Fire Temple, Yanar Dag, and the outside of the Heydar Aliyev Cultural Center. You can also opt to hire a taxi and do this tour your own, but it will be MUCH more expensive. Baku is one of the few places in the world where you can see mud volcanoes. A rare phenomenon that only happens in certain areas, these naturally-formed bubbly mud pots look like mini volcanoes dotted across a flat area of dirt. They’re cold to the touch. In many places around the world, the bubbling mud is caused by heat. However, in Baku, the mud volcanoes are cold because they’re caused by gas pockets under the ground. They’re not just in Baku. There are mud volcanoes in a bunch of different places around Azerbaijan! The Baku ones are simply the easiest to see, especially if you have a short time in the country. Some people use them as mud masks. You’ll probably see such people when you visit. But I wouldn’t dare… I’m not sure there’s any scientific evidence to back these claims. If you’re a natural history or archaeology nerd, you’ll love Gobustan National Park. First of all, it’s naturally very beautiful, with giant boulders strewn about as if they were tossed into a pile by a child at play. More importantly, on said rocks, there are ancient (I mean, 1,000+ years old) petroglyphs carved into the sides, depicting scenes from the daily lives of nomadic inhabitants of modern-day Azerbaijan. I’d be remiss if I didn’t mention one of the best meals I had in Azerbaijan, which was on my day tour of Baku. Our tour group arrived at an Azeri lunch buffet which was full of every kind of food I read about when I googled “foods to try in Azerbaijan.” The kicker? The entire buffet only cost 10 AZN. That’s the equivalent of $6 USD, all you can eat! A pilgrimage site for people of the Zoroastrian faith, the Ateshgah Fire Temple was built sometime between the 17th and 18th centuries. Here, you can learn more about the history of fire worship and the current practices and traditions around it, complete with somewhat creepy wax models and museum-like panels inside of the reconstructed historic site. Of course, the actual fire is the main point of focus here. It sits in the center of the temple complex in a small shelter and burns perpetually. Yanar Dag is a special place, and while it’s not one where you’ll linger for a long time, you’ll probably want to see it for yourself. While Azerbaijan is known as the land of fire, Yanar Dag is actually the land that’s on fire. You see, here, natural gas is so abundant that it causes a natural fire on the hillside that burns forever and ever. It looks like there’s burning charcoal leaking out the side of the hill…pretty cool if you ask me. My only reservation about going here with a day tour is that you’ll usually end up here in the heat of the afternoon, which is mildly unpleasant and not as epic to photograph. Ah well, beggars can’t be choosers. If I could do it again, I’d come back here at sunset or at night. Per my recommendation, you probably saw this yesterday more thoroughly. However, if you opt to take the TES day tour of Baku, you’ll visit here again as the last stop on your tour. This one is not part of the day tour, but one I wanted to throw in here anyway. Whether you decide to take the day tour or simply rent a car or taxi and do it yourself, you’ll probably end your day in the early evening. This gives you enough time to enjoy a traditional Azeri meal and a glass of the traditional pomegranate wine: a final toast to your amazing (and maybe exhausting) weekend in Baku. If you’re itching to get outdoors, you can take a day trip from Baku to the highest-elevation village in Azerbaijan. Azerbaijan Traveller offers a wonderful trip (they’re the same company that run the free walking tours). The trip spans a full day (9 AM-9 PM+) and takes you to both Quba and Xinaliq. This is a great way to experience what life is like in Azerbaijan outside of Baku. Sometimes you just need an escape from the busy city, and Gabala can offer that to you. Gabala is a resort area popular with Azerbaijan’s locals, filled with lots of beautiful scenery and outdoor activities. You can take a day trip to Gabala with TES Tour. Want to spend more time in Azerbaijan? Here are 17 places you can explore in the country! Planning on renting a car? You can do so here. Don’t forget your travel insurance! World Nomads has your back in case of emergencies.